Selected for the official TED bookstore (2013), YOU ARE A CIRCLE is a stunning visual poem where you’re invited (and challenged) on a journey to explore your creativity. Jenny Pennywood is fine artist, Jen Garrido's alter art ego. She name her back in 2008 as an attempt to keep her painting practice separate from her craving for more commercial work. Currently, Jenny Pennywood is a home textile line focused on created small batch, locally made, everyday products. All fabric is screen-printed in water-based inks and sewn in San Francisco, CA. Soothing blend that relaxes the body and mind, while enhancing dream time. With catnip and damiana at its base, this blend is a denser smoke that inspires introspection with tones of magic. Aiding in sleep, the mugwort in this blend allows for deeper dives into dream time. The Prism Oracle Deck explores the connection between emotion, intuition, and color. Each card in this deck is related to a specific energetic vibration created by color. The Prism Oracle allows us to break down our inner thoughts and emotions. By tapping into our own intuition, we can empower ourselves to become our own guides. Clean green notes of Cyclamen, Primrose & Jasmine. Made from the finest organic woods and essential oils for a gentle fragrance and a smokeless burn. Use to energize & invigorate. Perfect for new creation. Palo Santo Skin Potion was created to elevate both mind and spirit. 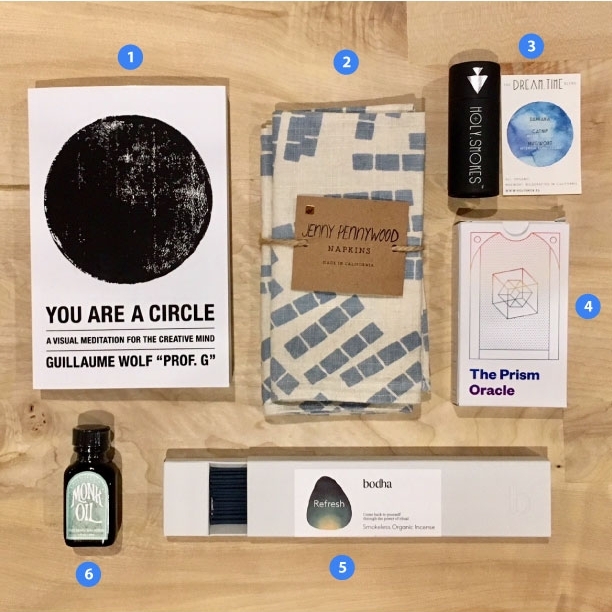 Created in collaboration with Incausa, who are dedicated to sharing the ritual and devotional characteristics of Palo Santo through their unique, handcrafted incense. Incausa provides Monk Oil with the pure, small batch Palo Santo essential oil from Peru.